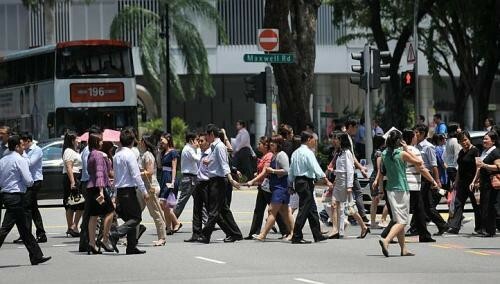 Many people grumble about their jobs but it seems most Singapore employees are satisfied with their lot and will probably stick with their employer for a few more years at least. In a new survey, more than 70 per cent of the respondents said they are happy with their working hours and workload, as well as their career prospects and development. Findings also indicate respondents are likely to stay in their jobs for five more years on average. Age is one determining factor. Respondents aged 15 to 29 said they are likely to stay at least three more years, while those aged 40 or older will probably stay for at least seven more years, taking retirement into account. The findings are from a survey of 1,003 workers aged 15 to 59 commissioned by Cats Recruit, a Singapore Press Holdings (SPH) unit, in May. In terms of work motivation, younger employees seem to be driven by different concerns - 42 per cent of those aged 18 to 34 cited higher pay as the most important factor in terms of what would keep them happy. For the overall group, the figure was 37 per cent. Higher pay would motivate 19 per cent of the younger respondents to take on more challenging assignments, compared with 16 per cent overall. Ms Sandra Soon, an assistant vice-president of the strategic marketing department (research and analytics) at SPH, said: "Higher pay and challenging work are something employers can work on." The department was commissioned by Cats Recruit to do the survey. Ms Soon added that "people are more conscious about working overtime and want greater work-life balance". This view was reflected in the survey - 57 per cent of respondents said they are only "somewhat willing" to work overtime, whereas just 24 per cent said they bring work home at least once a week. The survey also noted that about 40 per cent of all respondents ranked having a job that uses their skills or expertise as the most important job aspect, while 37 per cent ranked job security as the second most important. Ms Soon said people are increasingly looking for a five-day work week - something seen as important in promoting a family-friendly work environment.